Claire, who hails from Brisbane, Australia, is an amazingly talented blogger and photographer with mouth-watering recipes that all call out to me – seriously, a foodie after my own heart! Check out Claire K Creations if you haven’t already. But back to the salad – I have to laugh any time I make anything “Asian” – it always reminds me of the Margaret Cho bit where she declares that Asian chicken salad “is not the chicken of my people.” Ha! I’ve also seen this called Chinese Cabbage Salad. Still, it does describe the flavors that you’ll encounter here with soy sauce, mirin, and sesame oil all contributing to the tasty dressing. You can throw in whatever vegetables you like and have (I swapped Claire’s snow peas for red pepper and chives for scallions), and I’ve found a number of quick cooking or fried noodles work as well. If you add them at the last minute they add crunch, while after sitting they become tender and make it like a cabbage-noodle salad – win-win! This Asian cabbage salad recipe is flavorful, easy to make, and packed with veggies. It's the perfect addition to any potluck or barbecue, and is great with shredded chicken as well. Put the cabbage, carrot, zucchini, pepper, scallions, almond slivers, and uncooked noodles in a salad bowl. Pour half of the dressing over and toss vigorously until every piece of vegetable is coated. Add more dressing until the salad is well dressed. The remaining dressing will keep in a sealed container in the fridge for at least 1 week. For more information about the Secret Recipe Club, visit their website! beautiful, healthy, delicious – everything you want in a salad! I love cabbage salads and this one looks delicious. I have never added noodles to one though. I’ll have to give that a try. Perfect pick to herald in Spring for the SRC. This looks great – with all the peppers it’s so cheerful which is so welcome this time of year. Great SRC pick! Katherine you’re so sweet! I’m glad you liked the salad. The first time I made it liked it so much we had it a few nights in a row until my husband said enough was enough. I didn’t realise it was an American favourite too but I can see why. Beautiful photos! That looks so good! I love that there’s zucchini in it. I don’t know why, but I’d never thought of adding it to a salad like this. What a pretty salad! Love the colors and textures! Such a nice salad! I love cabbage – very versatile. Such beautiful colors and an amazing sounding salad, can’t wait to give it a try as I’m saving this recipe. I always think about my Chinese colleagues looking at the Chinese restaurant dishes and asking us what that dish is…. Anyway, love the salad looks healthy and delicious! What a wonderfully healthy side dish! I know we will enjoy sampling this one!! I am in Group B and stopping by for a quick peak…pinning this one! Great looking salad! I do love Asian flavors (even when they’re “not of my people”), and you’re right that this really is a great BBQ dish. Good stuff – thanks. What a beautiful salad! I love the combination of flavors. Yum! Mmm, love Asian salads. Just made one last week that had a spicy peanut dressing. Still have some cabbage left so I think I’ll try this one. Cabbage has quickly climbed my list of favorite salad fixings, since it does travel so well and is nearly as good the next day. This one looks particuarly delicious. Sorry about your oven though! 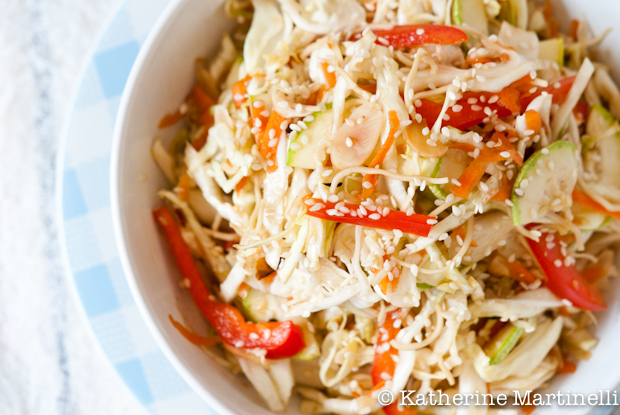 I never tire of Asian cabbage salads and this one sounds terrific! What a refreshing, crunchy delight. So nice to see the humble cabbage shine! I love this salad because it always keeps so well in the refrigerator. That way I can enjoy it for several days! Her recipes are lovely, aren’t they? If I remember correctly, I made a delightful tofu satay when I was assigned her blog. Yes, yes, yes – this is how I cook and make salads – European-born and all 🙂 ! What a beautiful appetizing salad at times one just cannot wait for the next meal!! Oh this is not only delicious looking, crispy with acid and healthy, it’s pretty. Such a gorgeous portrayal of this salad! 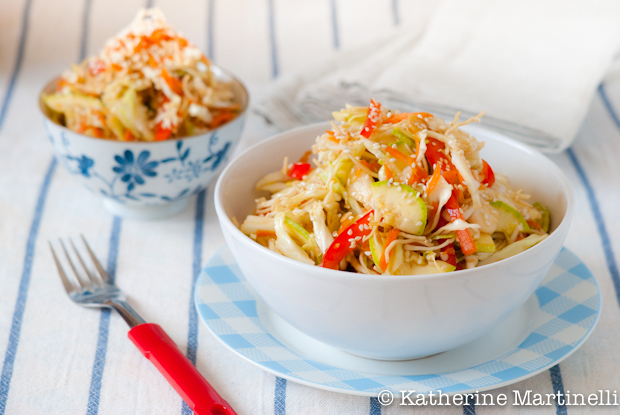 I’ve never made an Asian Cabbage Salad, but it does look like the perfect BBQ side-dish. I’ll have to take this to one of my husband’s work BBQs this summer (if summer ever makes it). Great SRC choice! Love this! I’m a huge fan of slaws and I love the Asian “kick” that you’ve made here. I think I have all of the ingredients, so this will be on my table tonight! I’m a big fan of a fresh asian salad – so full of flavour and this one looks beautiful. May be it has something to do with your beautiful photos! i made this today and it is SOOO good!!! thank you! i left out the zucchini because it’s hard to get where i lived. didn’t miss it! Great recipe! Made this last night and the boyfriend and I loved it! Super quick and easy too! Thanks for sharing!